Green beans cooked properly have a slight crunch. 1 How Can I Make Canned Green Beans Taste Good? Green beans are one of those vegetables that are divine when they are cooked to a perfect tender-crisp, but they can easily go wrong if you cook them too long, which turns them limp and mushy. 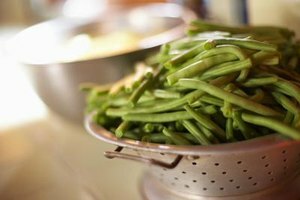 Briefly blanching the green beans ensures they get fully cooked while maintaining their crispness. Finishing the green beans with a quick saute adds flavor and gets them just tender enough to be easily pierced with a fork. Fill a large pot with water and bring it to boil. While the water is boiling, add cold water and ice to a large mixing bowl. Place the green beans in the boiling water to blanch for about 3 to 5 minutes. They should be just slightly tender, but still quite firm when they are ready. Drain the hot water from the green beans, then plunge them into the bowl of ice water. This stops them from cooking further, so that they remain firm. Let the green beans sit in the ice water for the same amount of time they were blanched before draining the water. Heat a thin layer of olive oil in a saute pan over medium-high heat. You an add a few pats of butter for flavor if you prefer. Add the green beans and cook, stirring occasionally for another 5 minutes, until the beans are fork-tender but still fairly crisp. Season with salt, pepper and any other seasonings you prefer. Serve hot. You can also blanch the green beans and briefly finish them on the grill in a grill basket or on a grill pan. Saute additional ingredients to top the the green beans, such as diced onions, garlic, peppers and sliced almonds.